For me, 30° is cold. Ok, let's face it, for me, anything under 70° is cold. *Note, all temps in Fahrenheit. This morning, I was scheduled for a 9 mile run. Due to Thanksgiving coming up and running a paved trail I've never run before and wanting to run to the end of that before turning around, I actually did 13 miles. I digress. I do that. Anyway, cold. I have run in the cold. Occasionally, some. Like a 4 mile trail run when I'm at an endurance horse ride. Or my half last year. But I usually am cold and miserable during most, if not all, of the run. Being that the Chattanooga Marathon is in March in TN and it can be 25° or 60° and I have to train all winter, it's time to figure out how to run in the cold...and not be miserable. I don't have any winter running tights (yet) so I wore a pair of my winter riding tights, complete with inside knee patches! 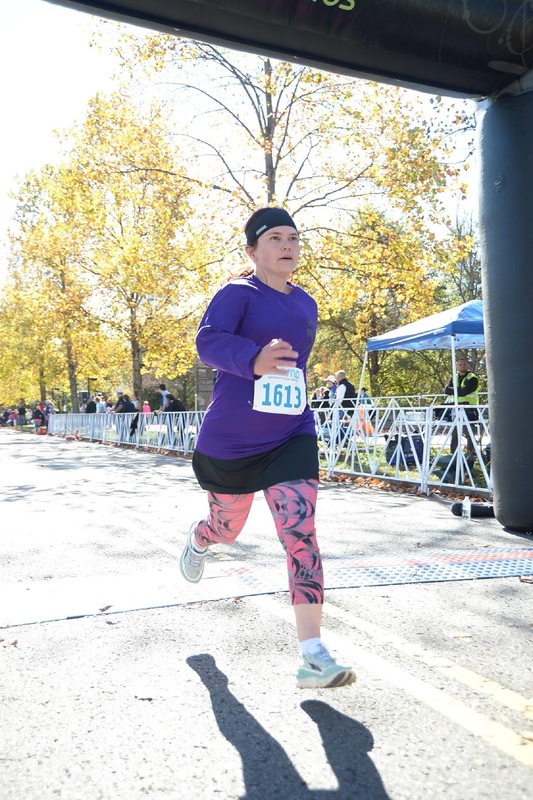 I was the only runner I saw wearing knee patches. :-D These are like form-fitting sweat pants with a wind/water/mud resistant exterior. These worked really well. 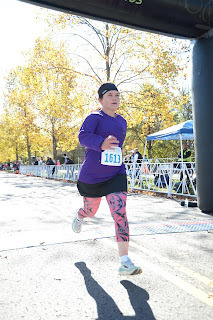 I felt warm and comfortable over most of my legs for most of the run. Now if I can find some similar running tights complete with pockets (these have no pockets) and minus the fancy knee patches. 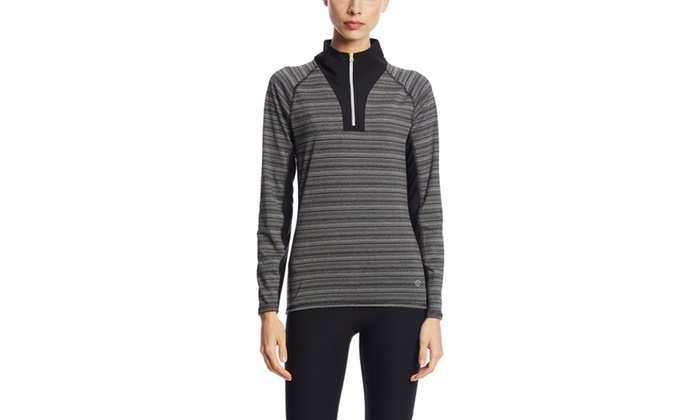 Shirt: Vogo long sleeve, semi-thick, half zip top. I think I got this at Ross or TJ Maxx. This looks similar, except mine is black with a yellow zipper. On my head, I put a head band with ear flaps and a light-weight skull cap on top of that. Hands had a cheap pair of knit one-size-fits-midgets gloves. Feet had DryMax trail running socks and Altra Paradigm 1.5 shoes. I chose the trail socks because they were thicker and, I hoped, warmer, than my other running socks. I hopped out of my warm truck and jogged around the parking lot. And was freezing. I couldn't imagine running in that cold! My arms were frigid! So I slid a Hanes sweatshirt on over everything and headed out on trail. About a mile from the truck, I was warmed up and ditched the sweatshirt off trail at a convenient spot. I was cold again, especially my arms, but it was better than before. Around mile 8, I finally pulled off my skull cap and stashed it in a pocket on my water belt. I took my gloves on and off, sometimes only one off, sometimes both on, sometimes both off. I played with my shirt zipper, sometimes fully up, sometimes fully down, sometimes in between. On the way back, I picked up my sweatshirt and tied it around my waist for that last mile. Then disappeared into the bathroom where I stripped my sweaty tank and shirt and put the dry sweatshirt on. Very good thing to do! I'd read to get out of my sweaty things, especially on my core, asap. They were right. It was 37° when I finished my run. I love the zipper on my shirt. Quick easy way to control core temp. My arms need more than one layer in 30° weather, even if it is sunny. Keep dry clothes in the car to change into immediately after a cold run. Remember dry socks, so you don't have to get some at the grocery store and sit down in the middle of an aisle to change them before even paying for them (they didn't care, I did have the bar code and they did scan it). 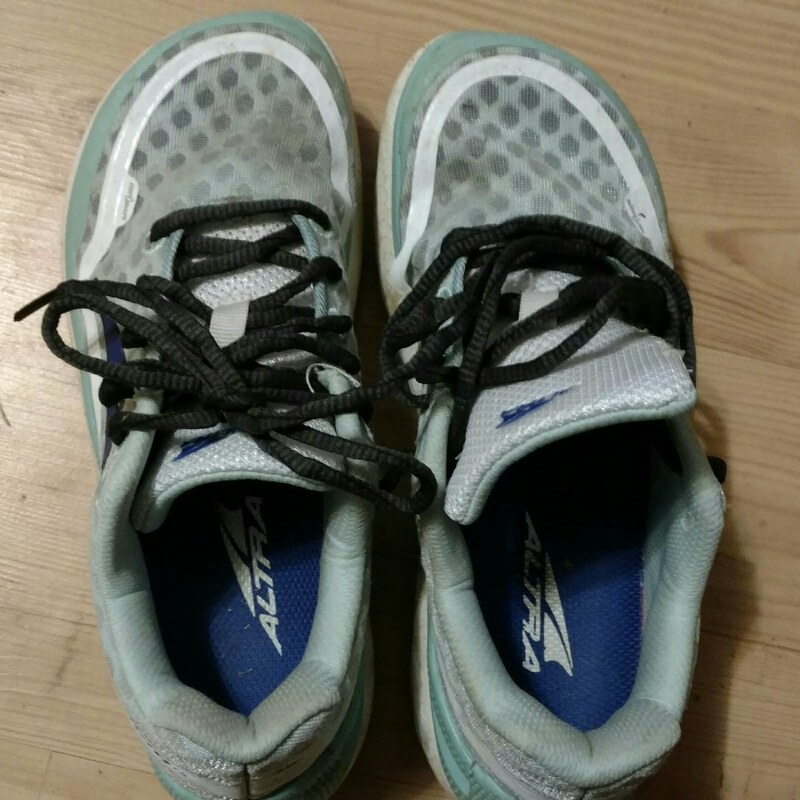 The Paradigm 1.5s, while lovely and cushioned and I really want them to work, just don't seem to be working for 12+ miles. Blood blister on top of blood blister from my half 2 weeks ago! 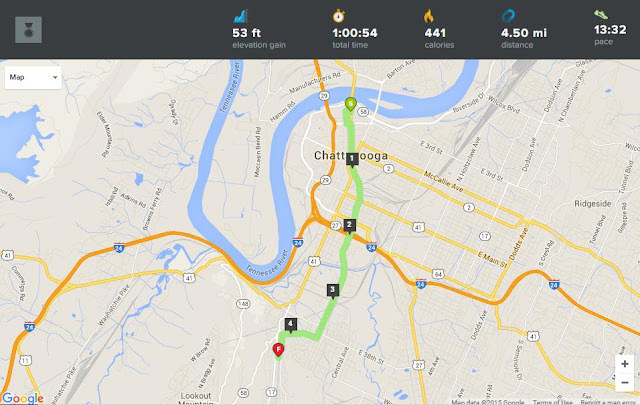 This morning, I rolled out of bed, pulled on my running clothes and went to run the first 4 miles of the Chattanooga Marathon course...on my treadmill. I have a NordicTrack 1750 with built-in iFit support. I managed to snag a 50% membership for a year. One of it's major selling points (for me) is to be able to chart a course on Google Maps and then the treadmill will alter its incline to match (as closely as possible) the actual course. You can also see the street view while you're running. Kinda fun stuff! Last night, in prep for my run this morning, I drew out the first 4 miles of the course, including a warm-up and cool down and then adjusted the speed to do an easy run/walk workout as I was scheduled for an easy run this morning. One thing that bugs me about the iFit workouts is you can't go in and edit them after you create them. So if I wanted to alter the ratio of run/walk or increase the running speed for each run segment, I can't do that on that one workout. I have to go create a whole new workout. iFit and my treadmill have the capability to show Google Street View, but I left the display on map only. I want to see the surroundings when I'm actually running the marathon next March. I plan to make other workouts with portions of the course to "run" on my treadmill over the coming weeks.